Expedition cruises to Antarctica are very dedicated and distinct trips, with every tour including lectures and presentations aimed at educating guests on all the environmental issues the continent – and in turn our whole planet – is currently facing. Guests learn the importance of protecting fragile wilderness (by sterilising their shoes after each on-shore excursion and vacuuming their clothes, for example), they see the impact of global warming with their own eyes and also learn about the delicate balance that’s needed to keep the feeding wildlife circle thriving. On an Antarctica cruise, you’ll learn about the importance of limiting pollution, of not overusing prime resources and of protecting even the smallest microorganisms so that they, in turn, may go on to feed larger species. An Antarctica expedition cruise is one of the most unforgettable, awe-inspiring and sobering travel experience you could ever have and that’s why the great majority of passengers return home with radically enlightened views on environmental concerns and with fervent desires to do something about it. So widespread is this incredible consequence that we’ve compiled a list of the Top 5 Most Common Environmental Changes People Adopt After Visiting Antarctica. Each one is not necessarily unique nor colossally restrictive to one’s lifestyle, yet each is immensely important, in the big scheme of things. Even more importantly, each one can be adopted even if you have yet to visit Antarctica. Because it’s never too late, or too early, to take a positive action to help our planet survive and thrive. 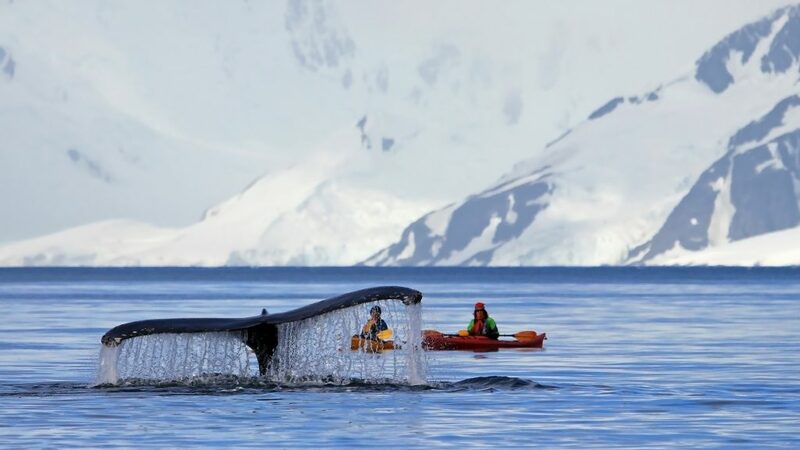 Kayakers in Antarctica catch a glimpse of a whale tail. Credit: Shutterstock. Plastic is the scourge of our planet and this has been recently highlighted with the reported death of a pilot whale in Thailand who had ingested so much plastic he could no longer eat nourishing food. This heart-breaking tale is not a rare occurrence, nowadays, and that may be the most tragic part of it all. Positively, the movement towards a plastic-free (or at least, plastic-minimal) life seems to have taken over the globe, with the banning of straws and supermarket shopping bags infecting every country, one by one. Although BIG measures are necessary, there’s a need for each individual to make changes in his/her daily life and this is the first real environmental action many Antarctica cruise passengers choose to adopt. They understand the detrimental consequences of even a solitary single-use plastic, will refuse bags and disposable cups and plates and start to make more purchases in specialized package-free stores where staples like pasta, rice and flour can be bought in bulk. Check out this article on neat tricks to help you change your plastic use habits if you’d love to follow suit. 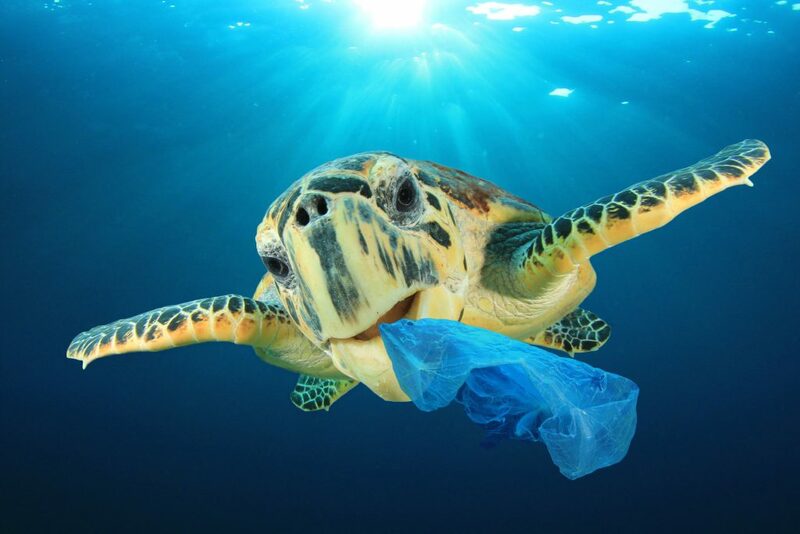 Sea Turtle eating plastic bag polluting ocean. Credit : Shutterstock. One of the most predictable responses of almost all Antarctica cruise guests will come towards the end of their journey. Just as they start to delve deeper into the impact we all have on our environment, and meeting expert environmental guides, everyone will invariably end up asking the same question: if I love this wilderness so much, then why am I here adding to the negative impact? We even blogged about the impact of tourism in Antarctica back in 2016. Aside from being a very natural question, it is also a very logical one, and you’ll be happy to know that, as far as scientists can tell, the benefits of tourism in Antarctica far outweigh the negatives, thus far. Antarctica visitors are among the most ardent environmentalists and the reason the continent is perpetually featured in ‘save the planet’ campaign is because so many of us have been there and fallen in love with the place. Put simply: this is the only continent on earth with no native population who can advocate for its protection. Moreover, the restrictions and conditions placed on cruise ships and their guests seem to be working quite well. Nevertheless, reducing one’s own carbon footprint becomes a major priority. The best ways to do this is by carefully so selecting what one buys and how one gets around. Use a bicycle whenever possible, organize carpools with colleagues, use public transport and spend more for a vehicle with better fuel efficiency. Buy locally-grown or made products, thus reducing the emission needed to get products from abroad. Don’t buy fruit and vegetable outside their season as they’ll have to be flown in. Think about each purchase, both large and small. Improve your home’s insulation to reduce heating/cooling needs, install solar panels and switch to energy-efficient appliances. There’s literally a ton of stuff you can do to reduce your personal carbon footprint. The planet will be ever so grateful. Moreover, it’s important to keep the pressure on local lawmakers so they know that reducing carbon footprint should be treated as the priority it actually is. 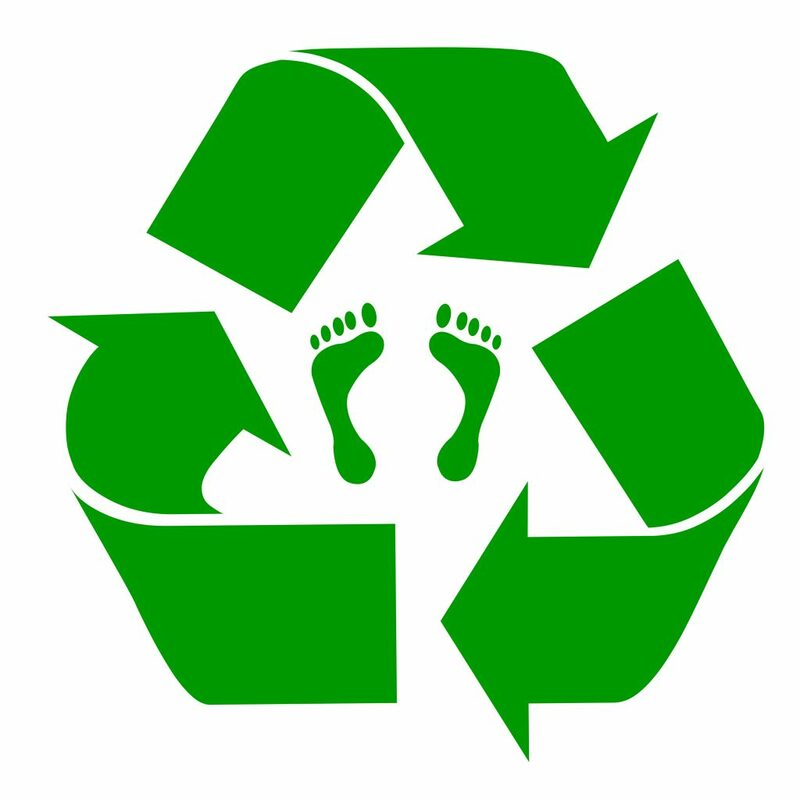 Green recycling symbol with carbon footprint. Credit: Shutterstock. Did you know that a single tree can soak up about a ton of carbon dioxide during its lifetime? Antarctica cruise passengers usually do and that’s why, as the first order of business, they become environmental ninja warriors as soon as they get home. Planting a new tree at home – especially with young kids and grandkids – is a great way to see your positive impact growing and a fantastic way to educate the children in your life, who see you putting your money where your mouth is and doing something about the environmental problem you care about solving. 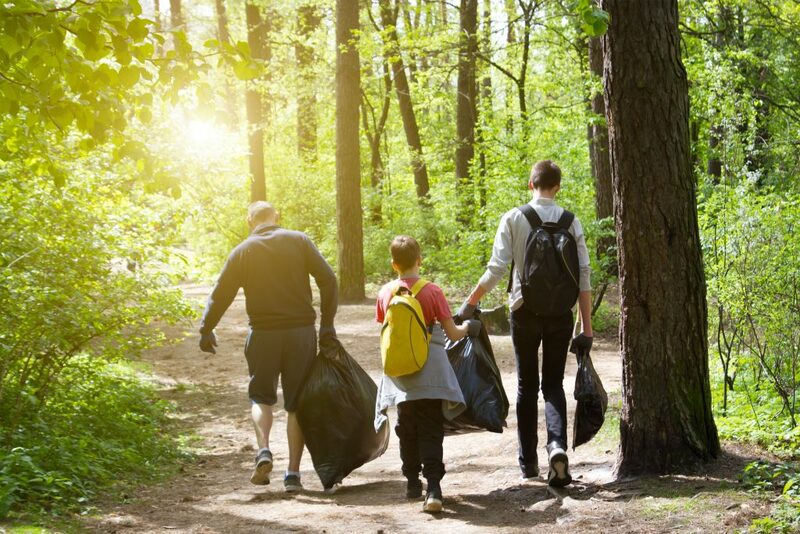 If you don’t have the space to plant a tree in your garden, then organize a clean-up day with some friends and their families, hitting a local rubbish hot-spot near your home that could do with a clean. Every piece of plastic you pick up cannot end up in the stomach of a pilot whale and that can only be a great thing. Visit the Clean Up Australia website for inspiration on how to best organize your efforts. Three people doing recycling of waste in little rubbish garbage trash. Credit: Shutterstock. If you do have the space to plant a tree then you may have the space to start your own composting station. 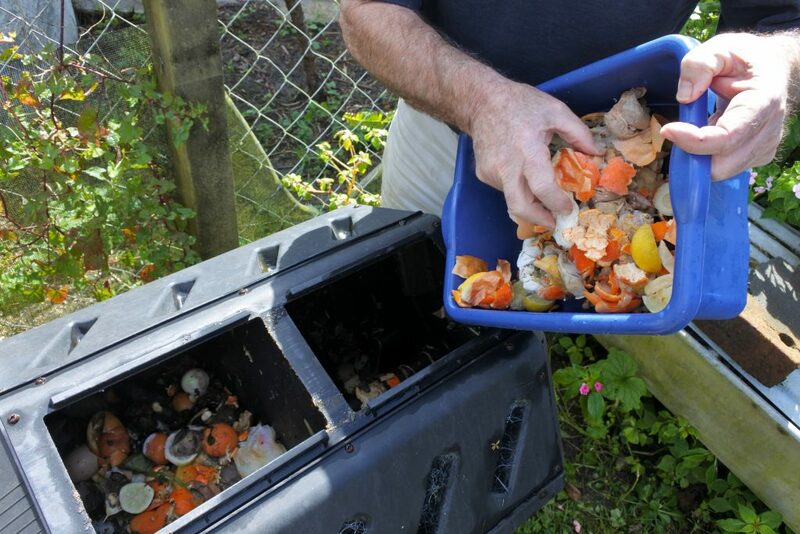 Composting is an amazing way to reduce waste and harmful greenhouse gases (released when the waste decomposes in landfills) and isn’t nearly as difficult as you may think. Join the Compost Revolution, get your local school involved and help the planet from the inside out! A container full of domestic food waste, ready to be composted in the home garden. Credit Shutterstock. It’s disheartening to know that so many people go to much effort to reduce their impact on the environment and then undo all their good work by wasting a ton of food, every single year. Food that had to be grown, produced, packaged and transported. If a visit to Antarctica does anything to you, it’s arguably to make you think long and hard about how easy you have it, when it comes to feeding yourself. Almost all of Antarctica’s wildlife must travel thousands and thousands of kilometres each year in order to have a decent feed, and when you consider how catastrophic it would be for just one species to go extinct – and risk unbalancing the entire food chain – it makes one appreciate the importance of every single morsel of food. So shop conservatively, freeze and refrigerate what you can, eat those leftovers and keep vegetable scraps for making stock before composting them. Don’t fill the pantry with tins and packets that’ll likely die long before you use them and learn new recipes to make preserves, pickles and jams. They last longer and are usually tastier when produce is past its best-by date. Australians waste an estimated $10 billion worth of edible food every single year, which puts an untold (and totally unnecessary) burden on our environment, not to mention our wallets. 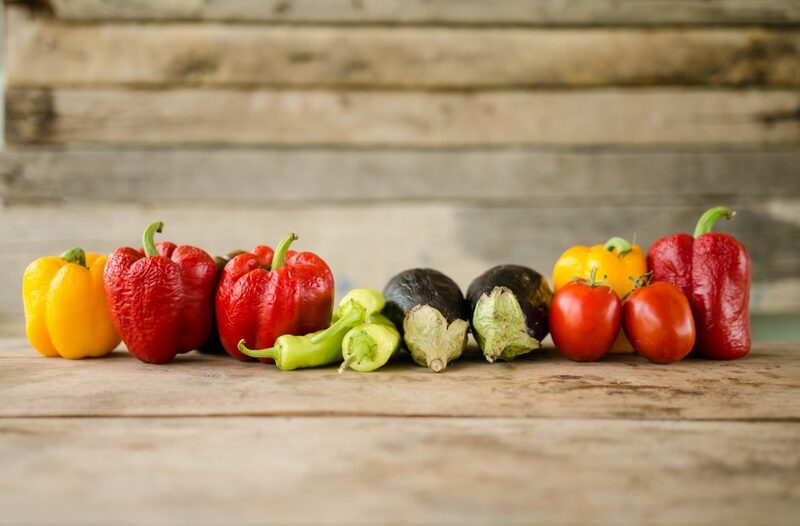 Although a big chunk of that is within commercial sectors, Australian families are still wasting up to almost $4,000 worth of food every year. There’s no doubt that the single biggest threat to Antarctica’s survival is global warming and, in this, the startling frozen continent is not alone. Just recently, Antarctica has been found to be greener than ever, with the reputed 3C temperature rise favouring the growth of moss and it seems the progress, over the last 50 years, has been swift. Ice is melting sooner every year here than ever before (much like in the Arctic) and the change in temperature has also seen a change in wildlife behaviour. 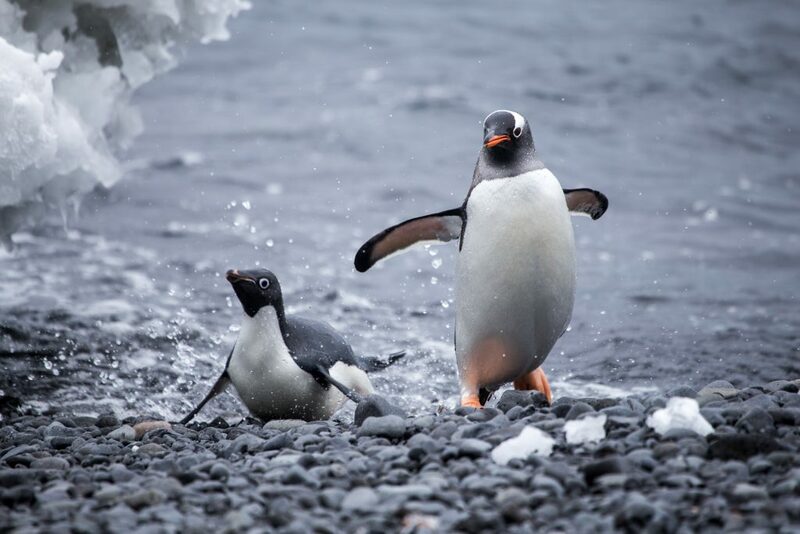 Where before the Adelie penguin was the most seen species, nowadays Gentoo are seen more and more. The former was particularly adapted to much colder climates whilst the latter, more sensitive to the cold, hardly ever made it this far south. Luckily, the two cousins seem to be avoiding food fights, for now, but there’s just no way of knowing what all this means. An Adelie and a Gentoo penguin come out of the water. Credit: Shutterstock. Protecting Antarctica means protecting the whole planet and you’ll never understand this better than by partaking in an Antarctic expedition. Learn more about Antarctica on our blog archive and contact us for more details of our upcoming expedition season. Antarctica cruise aboard the M/S Expedition. A great value option for touring and travelling around Antarctica.